Editor’s note: Peter Renton is the editor and publisher of the Social Lending Network, a blog dedicated to peer to peer lending. You can follow him on Twitter @socialloans. Peer to peer (p2p) lending was always an idea with great potential. It is a simple concept. Match people who want to borrow money with people who want to invest money. Cut the banks out of the equation and everybody wins. Of course, it hasn’t been that simple. When the industry was just getting established the two leading players, Lending Club and Prosper, found themselves coming under the scrutiny of the Securities and Exchange Commission (SEC). In 2008, while still in their infancy, both companies had to go through the expensive and time-consuming SEC registration process. Even though many people were writing the industry obituary at this point both Lending Club and Prosper survived. Today, both companies are thriving as the industry is gaining widespread support from borrowers and investors alike. With greater than 100% year over year growth p2p lending is one of the fastest growing investments. Industry volume is now over $50 million in new loans a month and over the Memorial Day long weekend total loan volume passed the $1 billion mark since the industry began back in 2006. 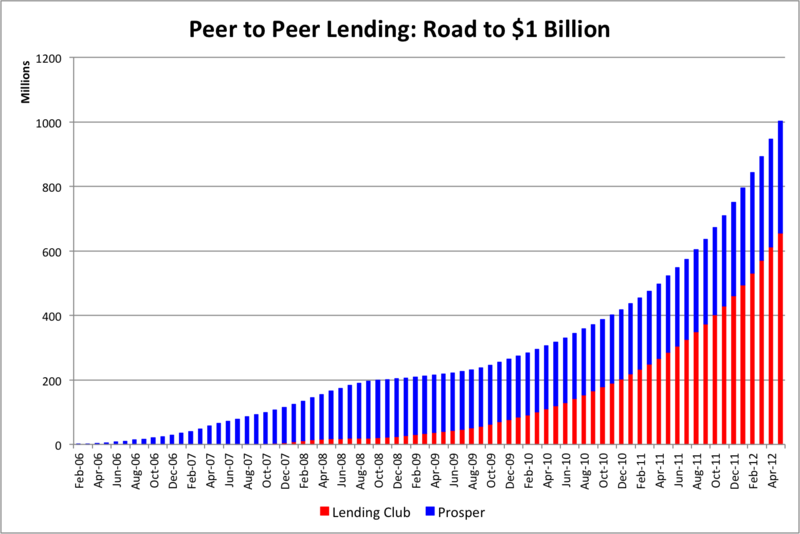 Both Lending Club and Prosper continue to see impressive growth as shown in this chart. What is behind this rapid growth? After several years of low interest rates investors are actively seeking alternatives. Peer to peer lending offers returns in the 6-10% range and the possibility of even earning more than 10%. While there are risks most investors are earning far more at Lending Club and Prosper than they are in traditional fixed income investments. Last year institutional investors started moving serious money into both Lending Club and Prosper. There is now over $100 million in institutional money invested at Lending Club and that number is growing all the time. Prosper has several large institutional investors including one who has invested close to $30 million and pledged another $120 million in coming years. By far the most common type of loan on both Lending Club and Prosper is debt consolidation. People are trying to dig themselves out of credit card debt where rates can routinely climb north of 25% if a borrower misses a payment. Someone with decent credit can get a 36-month peer-to-peer loan at 12%, pay off their high interest credit cards and become free of credit card debt in three years. It is a win-win for the borrower and the investors who loan the money. It is not news that bank credit remains tight. Personal loans are very difficult to obtain and the popular form of borrowing last decade – the home equity loan – was killed by the financial crisis. Small businesses are also feeling the pinch so business owners continue to look for alternative means of financing. When one of the titans of Wall Street joins the board of a p2p lender, as John Mack (former CEO of Morgan Stanley) did recently at Lending Club, it provides a level of credibility that wasn’t there before. Prosper also announced this year that long time Goldman Sachs executive Eric Schwartz has joined their board. No longer could people write off p2p lending as a passing trend. Peer to peer lending is an idea whose time has come. Its rapid growth as it moves past $1 billion in originations reflects that. It provides advantages for both borrowers and lenders, more so now than ever before. Peer to peer lending is only just getting started so don’t be surprised if the $2 billion mark is crossed very quickly, probably within the next 12 months.